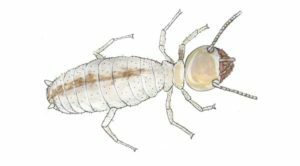 If you think you may have subterranean termites, please read below for useful information on their physical characteristics, behavior, signs of an infestation and treatment options. 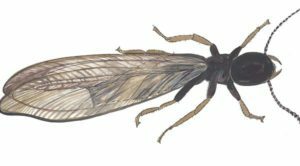 For more information on subterranean termites, please visit our Pest Identification Library. Subterranean termites get their name from living in the ground and building tunnels that look like mud tubes up to a structure. The mud tubes help to protect the subterranean termites from predators and dehydration. Subterranean termites are known to swarm late winter and early spring, usually after a heavy rainfall. Subterranean termite swarmers grow wings and fly out of the colony in search of a mate. Subterranean termites swarm at night and are attracted to the light illuminated from windows. Wings and black bodies will develop around windowsills and sliding glass doors. The swarm usually happens in the late winter or early spring after a heavy rainfall. Subterranean workers build mud shelter tubes for transportation between the colony and their food sources. The mud tubes help to protect the subterranean termites from predators, exposure to heat and dehydration. Mud tunnels can be found in the crawl space of a structure, under cracks in the concrete slab and areas where wood meets flooring. 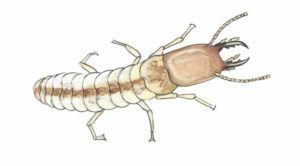 Subterranean termite damage can be left unnoticed because they only eat the springwood, leaving the grain and exterior surface intact. If the thin layer of wood is broken, workers will seal the break with mud to help retain the moisture inside. Large clumps of mud can be found inside damaged wood indicating subterranean activity. Subterranean termite treatments have radically evolved over the years. You may receive contrasting advice from competing pest control companies. We understand it may be difficult to determine the correct treatment for your home so we have provided you with detailed descriptions of the two most popular treatments: Bait systems and soil treatments. Not only are bait stations one of the easiest methods for subterranean termite control, they are also the safest for the environment. Termite bait stations involve the use of underground baits, which are carried directly to the underground colony without the use of toxic chemicals. The bait is consumed with virtually no poison left behind. Subterranean termites are social creatures living in highly organized colonies. Worker termites are responsible for feeding the entire colony. The workers obsessively forage for new wood sources in order to feed the colony. The installation of a baiting system involves inserting plastic stations into the ground every 10 feet, just outside the foundation of the home. Inside the plastic stations contain fresh pieces of wood, which are quickly discovered by foraging workers. The system targets the workers weakness to incessantly search for new wood sources. When a termite control professional discovers termites in the stations, the wood is quickly replaced with laced bait, which is then delivered to the entire colony by the workers. The poison quickly provides total subterranean colony elimination without the use of toxic pesticides. After eradication, the bait system provides peace of mind protection for the home all year round. Plastic stations containing wood are inserted in the ground every 10 feet around the perimeter of the home. Subterranean termite workers are constantly foraging for new food sources and quickly discover the stations. Subterranean termite workers then secrete pheromone trails from the stations to the colony, inviting other termites to feed from the stations. When a station is observed with termite activity by a technician, the wood is replaced with laced bait that cannot be detected by the termites. The subterranean termites feed from the bait and deliver a lethal dose to the rest of the colony, including the queen. Once the colony has been eradicated, regular monitoring provides 24/7 protection to the home. Are bait stations visible around my house? The stations are inserted into the earth and are flush to the surface. They are not visible at a distance and are often unnoticed. The installation takes approximately 30 minutes to an hour. The termite technician will return to check the stations. Stations with termite activity are fed laced bait. The technician will repeat the procedure every month until termite activity has halted. The entire eradication procedure takes an average of 2-4 months. The stations are perpetual and are monitored on a regular basis, even after the termite colony is eradicated. Chemical treatments will eventually wear off but baiting provides continuous protection for the home. Do I have to make any preparations? The stations must remain visible after installation. Keep mulch, rocks and landscaping free from the stations so that the technician can locate them during each service. If the technician cannot find the stations, the service cannot be properly performed. The traditional method for controlling subterranean termites is through liquid pesticides. The success of the treatment relies on the termite technicians ability to apply the pesticide into areas where the termites live and frequent the most. Hidden obstacles such as wall voids and subfloors create difficulties when attempting to locate the colony. It is equally difficult to evenly poison the soil around the perimeter of the home. Termites can build tunnels through openings 1/32 of an inch, allowing them to easily pass gaps in chemical applications. Even the most skilled pest control professional will have trouble applying a chemical barrier without gaps. The outside perimeter of the home is trenched and the soil is injected with chemicals. Hard to reach areas may involve drilling into the concrete slab in the home, porch and driveway. If the termites pass through the chemical they quickly die and can also transfer it to other colony members. The chemical has a residual and can remain in the soil for up to 8 years. The procedure must be repeated if termites return after the chemical has dissolved into the soil. Soil treatments are toxic to mammals and birds, highly toxic to bees, and very highly toxic to fish and aquatic invertebrates. Many gallons of poison are injected into the ground around a home and can last for years before it is broken down in the soil. Once applied, the chemical can bleed into streams, lakes and other aquatic habitats. Chemical treatments also have the potential to contaminate groundwater supply. The most talented pest management professional will have difficulty applying chemical barriers without gaps. Termites can easily slide by gaps in poison applications making the procedure fruitless. Liquid treatments require an invasive procedure. In some cases, concrete slabs inside the home, garage and driveway must be drilled to apply poison. Walls and ceilings may also require drilling. Soil treatments require dumping gallons of toxic chemicals around a home, which can runoff into bodies of water and poison aquatic life. The chemical takes years to dissipate and also has the potential to destroy bee colonies.